Would be space explorers will love this decorative rocket wall light that's lit by warm white LEDs for a magical glow! 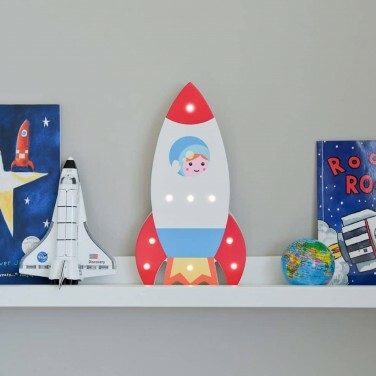 A little spaceman character waves from the window of a colourful rocket that has warm white LEDs in the nose, wings and fiery blast of the rocket making a fun wall light that provides comfort and reassurance at night. Battery operated, this colourful rocket light can be wall mounted or free standing giving you flexibility of placement in your child's room. Create night time fun with projections of outer space with this superb space torch and projector!